With so many resources available on the Internet, you may be tempted to try to learn more than one language simultaneously. In this post we will give our personal answer to the question: Can you learn two languages at the same time? There are so many good courses, and many of them free, that you may want to try them all. Sometimes we get excited with a language and want to start learning it. And then we get exposed to another language and then want to learn the other language too. And the list can continue growing to three or four languages. But one of the important and determining factors about learning a new language is consistency. If you constantly practice it during a significant period, you will learn become fluent in that language. Jumping from one language to another, just learning a few words in each one of them, will help you very little. And chances are that a couple of years later, due to the lack of consistency, you’ll just have a blurred notion or even completely forgotten the few expressions you learned. Our recommendation is to pick up one language and stick to it until you have mastered the basics. This could take you about 6 months to a year, depending on which language it is and how frequently you practice. After this, you could move to another language, without neglecting the first you have started to learn. Once you have selected a language, immerse yourself in its culture, history, and common beliefs. If you could even visit places where natives speak the language, it would be even better. The more focused you are the better. So if I’m already on track learning a language and all of a sudden I feel the vehement desire to start learning a second one, what should I do? Can I learn more than one language at the same time? Even though it’s not our recommendation, we know that you could learn two languages simultaneously. 1. The languages you’re trying to learn should be from different origins. For example, if you start to learn Italian and Spanish at the same time, you’ll get all mixed up. The origin of Italian and Spanish is Latin. It would be better for you to learn Italian and Hebrew, because Hebrew has a completely different origin. You will not have this problem if you’re learning one language at a time. If you want to learn just Spanish that’s fine! If you want to learn only Italian following learn-italian-language.com, that’s even better. The most difficult language in the group of languages we have mentioned for a person whose first language is English would be Hebrew. But if you’re only learning Hebrew, that’s ok. But if you want to learn two languages at the same time, even though Hebrew is the most difficult, it would be better to learn Italian and Hebrew, or Spanish and Hebrew. However, we suggest you shouldn’t combine Italian and Spanish. You will notice that Italian and Spanish are so similar, that while learning both, it would be hard to separate them in your brain. And the last thing you want to do is produce your own language mixing up these two. 2. How far away are the target languages you want to learn? If you’re learning Italian and Hebrew, and you only speak English, it will be easier for you to learn Italian than Hebrew. This is based solely on the fact that Italian is nearer to English than Hebrew. There may be occasions where family ancestry, cultural backgrounds or availability of resources may bend what’s considered easier. You should schedule your lessons to practice more the language that is more difficult for you. Also, if you’re practicing both the same day, consider practicing first the language that you like less and when you are tired move to the one you enjoy most. As an exercise before you start to learn two languages, determine which language will be more complicated for you. 3. If you only speak one language, do not attempt to learn more than three languages at once. When you are already a polyglot, you have learned by personal experience how to learn languages. And you could attempt the brave goal of three or more languages at the same time. But if you only speak one language, and try to learn three, the most probable result would be you won’t learn any of them. a.) Italian is a Romance language; this means it developed from Latin. This makes it fairly easy for English speakers to learn because it shares a lot of vocabulary with English. b.) Because Italian descends from Latin, it will open the door to understand and make it easier to learn Spanish, French, Portuguese and Rumanian in the future. Learning two languages at the same time is possible. We personally don’t recommend it, specially if you only speak one language right now. But we know it’s possible! Remember you’ll need a lot of determination and be well organized to succeed with both. I wish you all the best! Please share with us your experience. You don’t necessary have to agree with what we have said in this post. 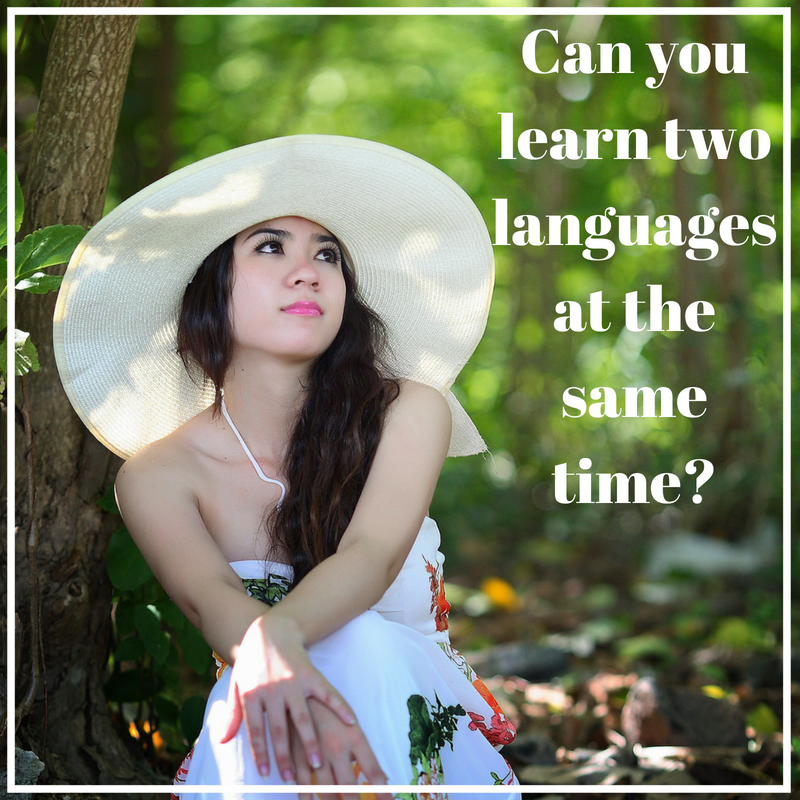 Have you been learning two languages at the same time? Are you making up your mind concerning pursuing two languages? Feel free to leave your comments below. Hi Henry! This is an ongoing discussion I have had with a friend. She insists our children should learn 2 languages at the same time. And I believe that one at a time is the best way to go. Your article has confirmed that I’m right. I’ll share your post with her. Thank you very much! Hello Debbie! Yes, that’s my advice. Let your children start with one language. Give them 6 month to a year of daily exposure to that language. And once they have mastered the basics, let them start studding the second. I’m glad you found this post useful! Keep well! My wife grew up learning Spanish and English at the same time. It was the norm in her family, which I always found super interesting! When you grow up listening to two languages, you learn them both effortlessly. With that background, her knowledge of Spanish made Italian readable. And further on it also made French pretty easy to learn, she says. Growing up in a home where two languages are spoken is one thing. But learning two languages at the same time as an adult is a completely different story. I agree with your recommendation of learning one language at a time. Again, this was extremely informative. Thank you very much for your comment. You have hit the nail right on the head. Keep well! Learning languages is an amazing thing that I find just as great as life. The various methods human beings can use to communicate through language enable us all to get connected and create strong bonding. The more we are open to others, the more we’ll get to comprehend peace and embrace it. I’ve been to Italy in a tour along the western cost from Rome to Amalfi, 2 years ago. I loved it! I loved nature, its language and food. I want to learn Italian, and have been making my mind if only studying Italian or learning two languages at the same time. But I’ll follow your advice and learn only Italian for now, because it’s the language I feel more attached too. My native language is Arabic, which is a difficult language as I hear. Aramaic is the origin for both Arabic and Hebrew (as you have mentioned in your example). There is not much common ground between Arabic and Italian, nor between Arabic and English. But if I already learnt English, I may not have such a difficult time learning Italian. At least I hope not! 🙂 I’m glad I found your site, and I know it will help me a lot! Hi! Thank you for your comment and I’m glad you found this site useful. I’ll be more that happy to assist you during your journey learning Italian. I know you’ll enjoy this wonderful journey. And you have a huge advantage over many because you already speak English. And there are some similarities between Italian and English. I wish you all the best! And don’t hesitate to write when ever you have a question. Learning two different languages at the same time is really tedious. But I’m being pushed to learn French and Italian. So I want to ask you: Is that a good decision? I know both descend from Latin. But they are not as similar as Italian-Spanish-Portuguese. Would you advice me to learn French and Italian at the same time? Or learn one first and then the other one? Hi, Mikay! Even thought French and Italian are not as close together as Italian-Spanish-Portuguese (as you have correctly stated), they are still close. I’d advice you to learn one first and then the other one. Just my personal advice. Hi Henry! I agree with you and I believe it’s better to learn one language first and after the other. But my brother has been planing to learn two languages at the same time. I’ll use your article as proof to sustain my point. Thank you very much! And I’m sure this post will also help him. Hi! Thank you for your comment. Say hi to your brother too, and tell him to consider the points I’ve mentioned in this post. I wish you both all the best!